The Nemo is a rather classic single-ended Class-A dual-mono power amp which uses the famous 300B vacuum tubes (Electro Harmonix Gold series). The input and the driver stage uses 2 x 6SN7 tubes, still from Electro Harmonix Gold series. As expected, the power output is also standard for designs like this, at 9 watt per channel on 8 Ohm. Frequency response is claimed to extend from 15 Hz till 35 kHz while the S/N ratio is 90 dB. The toroidal power supply transformers are mechanically decoupled from the chassis via soft dampers and the whole unit has been carefully designed and optimized to reduce vibrations. The Nemo is quite heavy, at 26 kgs (> 50 lbs) and seems built like a tank. The manufacturer claims to use laser-cut stainless steel to build the cabinet while the "base" and the front fascia are from solid Italian walnut. A wide choice of finishes and vacuum tubes is also available, such that the amp can be custom-built and tailored to meet customers' needs. A remote-controlled integrated version (with 3 passive line inputs) will be available at 200 € more. While the majority of low-powered amp designers suggests high-efficiency loudspeakers for their creatures, Labtek suggest only "from 89 dB/w/m on". It is quite surprising to know that the Labtek Nemo has been designed and optimized around a pair of Diapason Prelude III, certainly not an easy load nor high-efficiency loudspeakers. While Diapason kindly offered a pair of Adamantes so to make the partnership "ideal" (as Labtek suggested) I've preferred not to introduce another variable. Having recently reviewed another single-ended 300B class-A amplifier (Opera J500 Plus) I was ready for a similar kind of sound. Similar tubes (same brand), almost identical circuit topology and price range ...everything was suggesting very close musical performance. And I was wrong. This amplifier, similarly to other 300B equipped single-ended's, sounds very smooth and liquid in the mid-high range, a bit relaxed maybe, but certainly not slow. The BIG surprise comes from the bass and the mid bass: tuneful, tight and muscular like some of the best solid state power amps out there. I'm not kidding, this amp rocks: the electric bass notes do possess a "groove" and a boogie factor that is simply astounding, if you consider this is just a 9 watts power amp with a single pair of 300B tubes. Bass lines are very easy to follow, perhaps even a little bit overblown, but sooooo fun to listen to! You can detect every single note played by the bass guitar, even in the midst of intricate musical structures, while many instruments play together at the same time. Not an easy task! The Labtek Nemo appears to be a master in this area and its performance is surprising if one considers its low power output. Of course, you can't ask for more than its 9 watts but within this limit the "groove" performance is top-notch. This is the reason why I subtitled this review with "Get yo groove on" (taken from "Emancipation", Prince's excellent triple album - NPG Records 1996 - 7243 8 54982-2). I may have listened to "The holy river" song in repeat mode for 20 times or so. Kinda groooovy! The rest of the performance is good, even if not as good as in the bass/mid-bass area. Tonal balance tends to be neutral, with an airy high range and a fluid mid range. Not extremely precise and detailed nor analitycal, the Labtek Nemo impresses more for its "substance" than for the sum of its virtues. I mean, certainly there are areas that can be bettered (after all, it costs less than 3000 €, not much if you consider it is hand-built in Italy, not in China...) but the performance remains enjoyable "as a whole". Just let me cite some example taken from my notes. Voices on female choirs tend to be thinner than they should be. Male soloists do have some trace of edginess and a suspect of nasality. Cymbals should sound more metallic and splashy. Everything should be tighter in the mid-high region. BUT! When you put all these things together you tend to concentrate on the big picture and begin to forget the details. Is this musicality? I don't know. For sure this amp lets you concentrate on Music alone. There are amplifiers which excel in all of the aformentioned areas, when you analyze them piece by piece. When you try to put the pieces together you can't get a coherent image of the musical event. I call these amps (or HiFi components) boring: everything seems to be perfect but the fun factor is missing. Proper timing certainly plays a big role here (more on this later). The Nemo is pure fun, perhaps it's not perfect...but certainly it is NOT boring. So, unless your listening room is very small, you may need high efficiency loudspeakers (at least 93 dB/w/m). It is surprising to read Labtek suggestions for 89 db/w/m speakers (minimum). This can be misleading, to say the least. Anyway, provided you don't ask for "too much" (power, that is), the Labtek Nemo can sound lively, punchy and dynamic. For sure, it is much more dynamic than the Opera J500 Plus I reviewed some months ago. If you consider the two units are VERY similar (class A single-ended Electro Harmonix 300B amps) you can argue something inside the Nemo has been designed differently. Perhaps it is the massive power supply section, perhaps the better output transformers or the "Gold" series tubes (the Opera used standard series Electro Harmonix)...certainly something IS different. 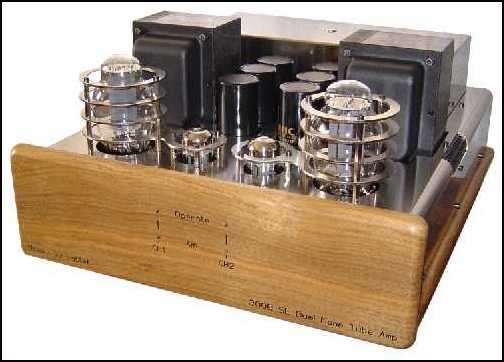 Then the Nemo has PRaT in spades (Pace, Rythm and Timing), like any good solid state amplifier. It is quick, fast, articulated and pacey, especially in the bass. I'm pretty sure this is what makes it so entertaining. In the microdynamics area, as said, this amp doesn't impress much, tough. It is not hyper-detailed so don't expect wonders. It gets the job done, quite simply, and tends to focus mainly on Music and not on standard HiFi parameters. The Nemo exhibits an interesting performance. While the focus can certainly be bettered (blurred contours here and there) the 3 dimensions of the stage are proportionally correct. Perhaps, the height of the soundstage is a bit vertically-challenged. Anyway, the depth of the image is good and allows the listener to detect several distinct horizontal planes. Width is also very good. Though it is claimed to operate in pure Class A, this amp does not run very hot. Anyway, the tubes are "exposed" so please put the amp far from children's reach. The power on procedure is quite long (a couple of minutes). After you switch on the amp you have to wait for the 4 green leds to light up. 30 minutes (at least) of moderate listening levels are recommended to let the amp reach its full potential. The power supply cord is already of good quality (more or less, it's the usual shielded mains cable as our DIY Merlino) so you don't need to upgrade it immediately (kudos to Labtek for this). The Nemo is equipped with custom-built spikes and spike shoes. As for speakers matching, provided the efficiency is high enough, I don't see any particular problem, as the Nemo is able to drive - within its natural limits - even tough loads. Manufacturing & finish. The Nemo appears to be solid and well finished. High quality materials have been used throughout and the level of craftsmanship is top notch. Please remember the unit is hand-built in Italy under strict quality control procedures (laser-cut chassis, microscope-inspected solderings, OFC cabling throughout etc.). For these reasons the price seems adequate. I'd have preferred a (removable) grid to prevent the user to touch the hot tubes. Children's safety at home is a too often overlooked issue. While warming up (and also when cooling down) metallic parts of the amp tend to "click" because of thermal dilatation. I haven't been able to detect the exact area where the clicks come from but the noises are clearly audible during the first 20 minutes or so of listening and can be quite annoying. Perhaps the tubes may have a role here but I've listened to other 300B amps which were deadly quiet. Deep bass should/may be better also. Mid-bass is a bit overinflated. Considering the speakers which have been used by the designer as a "reference" this doesn't come as a surprise to me. Indeed, the Diapason Prelude III's are a bit shy in the bass/mid-bass region (see my review). Groovy. That's what the Labtek Nemo is. Not the ultimate in transparency or precision but certainly a master in pace and rythm. Excellently built, reasonably priced, entertaining, this amplifier gets the fundamentals done right. The Company is an absolute beginner, but it seems to know well what to do. Available only factory-direct, at the moment.